3.3 Design Zone Properties – Welcome to the OptiSurface Support Center! Overview: This dialog box allows you to create design subzones, modify subzone extents, adjust subzone priority, delete subzones and modify design parameters. 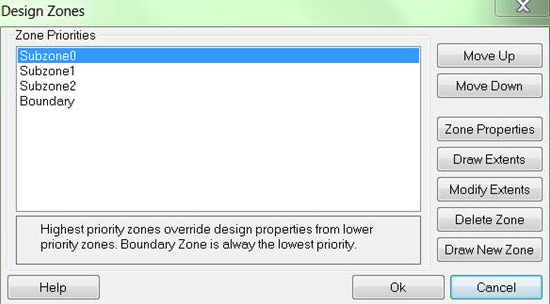 Every design file (osd) will have one boundary zone and zero or more subzones. Subzones must be contained within the boundary zone. Subzones can apply different design parameters to different areas within the boundary zone. Where a subzone exists, it will overwrite the design parameters of the boundary zone. The design parameters are mapped onto the calculation grid points that fall within that subzone. Subzones can overlap each other. Where they overlap, their ranking in the priority list defines which design parameter is actually sent to the OptiSurface Calculation Engine. Move Up, Move Down: If you have multiple subzones, you can adjust their relative priority using these buttons. The priority is only relevant where subzones overlap. Where they overlap, their ranking in the priority list defines which design parameter is actually sent to the OptiSurface Calculation Engine. 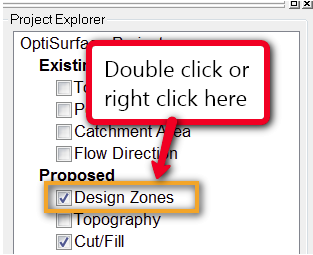 Zone Properties: Opens a dialog box that allows you to define the design parameters that tell the OptiSurface Calculation Engine what the proposed design surface should look like. Draw Extents: Define the extents of a subzone by drawing a polygon. After pressing this button, left click on the existing surface where boundary points are desired and double left click to finish and close the polygon. Modify Extents: Modify the extents of a subzone by editing the polygon vertices. After pressing this button, left click on the existing subzone polygon vetices then hold and drag to reposition. Right click on the points to get other options, like insert a point. Delete Zone: Delete a subzone from the project. Draw New Zone: Create a new zone and define the extents of a subzone by left clicking on the existing surface where polygon vertices are desired and double left click to finish and close the polygon.